This student hand-out was created specifically to accompany the PhET simulation "Nuclear Fission". It provides guided directions on using the simulation to ensure that students stay focused on learning goals. The simulation features a neutron gun that "fires" an accelerated neutron into a Uranium-235 nucleus. By using this printed guide, students will be prompted to think about what happens in a nuclear reaction, what makes a nucleus "fissionable" and how nuclear power containment vessels prevent a runaway chain reaction. 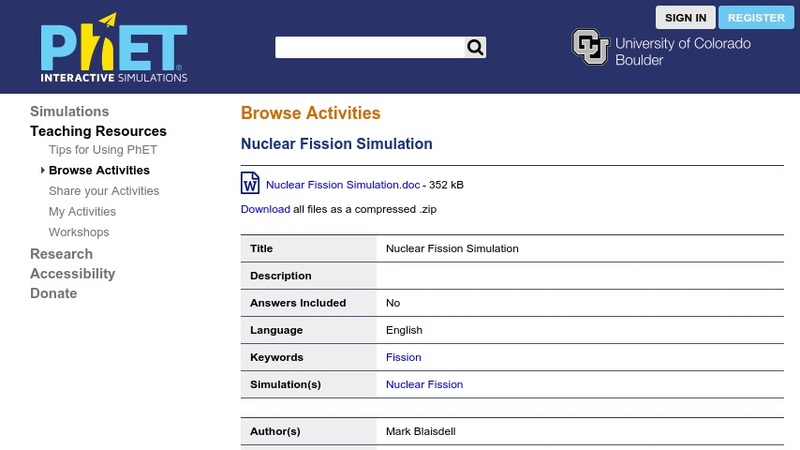 The fission simulation, which must be open and displayed to complete this activity, is available from PhET at: Nuclear Fission. This lesson is part of PhET (Physics Education Technology Project), a large collection of free interactive simulations for science education.